Steven is an expert in patents for a wide range of mechanical, electronic, and computer technologies, and he is also seasoned in trademarks for commercial establishments. Steven is an expert in patents for a wide range of mechanical, electronic, and computer technologies, and he is also seasoned in trademarks for commercial establishments. 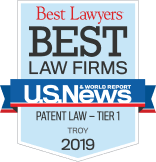 His professional experience includes a position on Ford Motor Company’s Patent Staff and associate patent counsel for Masco Corporation, where he counseled in trademark and international patent law. Steven received a Bachelor of Science in Physics and a Bachelor of Arts in Philosophy from the University of Illinois. He earned his Juris Doctor degree from DePaul University College of Law, where he was a staff writer for the DePaul Law Review. He has been published in Laches and Entrepreneur Network. He also served a term as a professor at Wayne State University School of Law, where he taught patent law, and at Ave Maria School of Law, where he taught trademark and unfair competition law.